I’ll never forget the sunset Tuesday night. Driving home, the space just above the horizon line was glowing pink and orange. A line of heavy clouds obscured the upper portion of the sky, leaving just enough space for the light to get through. The sun slipped down, revealing itself for a few moments, a huge orb of light. My view of the sky wasn’t perfect or full. Buildings and gas stations and warehouses blocked the sight, and I sped up, weaving in and out of traffic, hoping the highway onramp would unfold a better vista. But, by the time the stoplights cycled, the colors were already fading. I looked over, aware of my hands on the steering wheel, trying my best to match words to what I was seeing, the way blue and purple washed into pink and yellow, a watercolor western sky. It was one of those sunsets that seemed distinct from all the countless others I’ve witnessed. I felt lucky to have seen it — a true, unexpected gift — it only lasted for a few, fleeting moments. Had I not left work ten minutes early, I would have missed it completely. For the rest of my commute home, I turned the radio off, getting lost in anticipation. It was election night in America. I realize now I’d just assumed I’d be standing in front of a TV when the results were finally called, moved once more by the ideals of hope, democracy, unity, equality, and a brighter future. The voters would speak, rejecting fear and hate. I was ready to have my faith in the country restored. The last few days have been hard. I didn’t anticipate how deeply this election would emotionally affect me: sadness, anger, grief; the realization of profound misunderstandings, deep divisions. I hoped to find some solace by going to the park. The sun did come out today and yesterday, as it usually does, to remind us that nature does not bend to our moods. It was actually a beautiful day, warm sunlight, a blue sky. The colors of fall get brighter, more saturated — reds, oranges, yellows. There’s a particular smell right now, when you’re walking through the woods — crisp, spicy, earthy. There’s a small window of time before the leaves on the ground get damp and begin to decompose. That’s another smell; it’s both sweet and savory, like the smell of red wine. I made my way down the trail, beginning in my favorite part of the park. The branches of the younger oaks thread over the path; sunlight falls in a patchwork over the ground. A breeze picked up and the leaves rustled, and I stopped, watching: the sight of those yellow leaves falling all around, fluttering to their final resting place. I walked mostly, running only for a few minutes. My leg muscles ached and my body was too tired. My mental energies have been exerted elsewhere, and there wasn’t enough left. I passed several people — people with their dogs trotting ahead of them, a man in a business suit and sunglasses, another jogger. That we waved to each other, smiled, as strangers, lifted my spirits. Maybe we’d taken to the park for similar reasons, even if we had cast our votes differently. Near the first mile marker on the trail, there’s a sculpture of two children pulling on a giant wishbone. The top of the wishbone arches over the path; each child pulls on their own end, on opposite sides. Their bodies are frozen in the struggle, their arms stretched up, squatting into their effort. The race looks equal, and you can’t tell which one will win, where the bone will crack above them. If I have one criticism of the work of art, it’s that the children look too similar; they’re identical in fact. Neither looks to have an advantage. I’m not sure the world is actually like that, that there’s a fundamental fairness promised to everyone. Not everyone is an advocate for equality, especially when the disadvantages of one actually benefit another. Can the wishbone ever break evenly, divided down the center? Can there be more than one winner? Can we all get what we want? The artist didn’t reveal what happens, deciding instead to immortalize the moment just before the outcome of the competition. And so we toil on, pulling for our wishes. Maybe the wishbone hasn’t cracked quite yet. 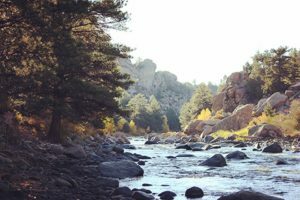 About three weeks ago, I sat on a rock by a river in Colorado, typing up a status update to publish on Facebook. 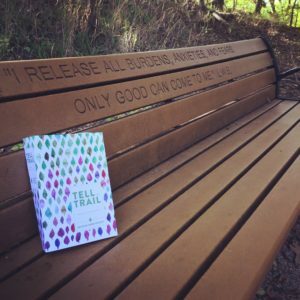 It was a sentimental date for me—two years ago to the day, my new book, Tell the Trail begins. After the post went live, I got up, brushed off, and took a look upstream. The river ran in a swift current around me, even though the water level was much lower than during the summer rafting season when the snow melts off the peaks. Up the hill, after a steep climb up the banks of the river, I found a monument. It was a huge boulder that looked more like an abstract sculpture, the center hollowed out to form a hole. On the top of the rock, a plaque was cemented into the surface of the stone. “Life can only be understood backwards, but it must be lived forwards. 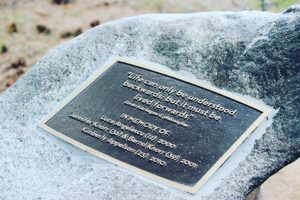 When I read the words on the plaque, I was overcome with emotion. “Life can only be understood backwards, but it must be lived forwards.” A quote from the philospher Kierkegaard. Under the quote, names and dates were listed to honor rafters that had died on the dangerous stretch of river. I stepped back, realizing it: I’d traveled over six hundred miles to finally find my answer. I’ve tried out a few different answers to the What’s it about? question. The truth is—I can’t reduce Tell the Trail down to just one sentence. I’m still in the midst of my story, living each day, feeling my way through my own narrative. I’ve wanted to capture every single detail of my life, everything from the mundane to the extraordinary. Looking back on the last two years, a lot has happened. 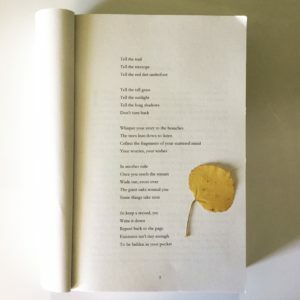 I published my first book. I turned thirty. My best friend, Emily, got pregnant and had a baby. I traveled from the East Coast to the West Coast, put my feet in both oceans. I learned a lot, I struggled a lot, I celebrated a lot. I’ve wanted to capture every single detail of my life, everything from the mundane to the extraordinary. I know now that one of the callings of being a memoirist is committing to the work of gaining clarity about your life’s story. Life must be lived forwards; we must live diligently and earnestly, paying attention. In having a record, I can look back, understanding. We aren’t usually interested in anyone’s journals or diaries until they’re famous. I’ve combed through the journals of Thoreau, Sylvia Plath, Virginia Woolf, and Joyce Carol Oates—some of my favorite writers, interested to see how their private lives flowed into their art. Maybe there will always be something a little thrilling about gaining any type of insight into someone’s innermost thoughts and struggles. We see ourselves mirrored back in the words of others; for once, we can relate. Journaling has been my mirror and compass, reminding me that writing is my passion. By keeping a journal, I’m learning the sound of my own voice. There’s a reason journal-keeping is used as a tool for introspection and contemplation. Journals are much more than a personal history book. My journal has been a safe place to sort out thoughts and feelings and a way for me to identify meaning. My journal reflects myself back to myself, reminding me what’s important. Reading back through my journals, I have a clear picture of significant events. I’ve learned worries and feelings come and go. By keeping a journal, I’m learning the sound of my own voice. My journal has been a compass, pointing me in the direction of pursuing my passion: writing. Writing gives me a way to convey an inner life I don’t always know how to express otherwise. So here it is. 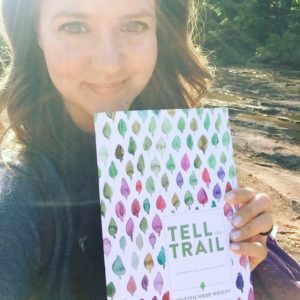 Tell the Trail, my new memoir. So here it is. Tell the Trail, my new memoir. Here are my journals, imperfect just as I am, bound up between two covers. Here’s my own personal history book, shared in dedication to living, to the act of remembering. Having kept a journal these past two years, I’ve found each day is special and significant, brimming with meaning. My journals have been a safe place to unwind the threads of my experiences and weave them into a larger story, a bigger picture of my life. Now, combing through the archives of a full year, to have detailed, daily records of what I saw and felt and thought, to trace out the horizon line of my own internal landscapes, I’m overcome by the width and depth and breadth of life. I’ve learned I must be a diligent scribe—and student—of my life. And maybe—I need to let other people read what I’ve written, what I’ve found. Maybe the record of one life will knit itself into the fabric of someone else’s. I ventured off the paved path today, into the thick brush of the park. Off to the right of the walkway, a slight parting of the trees revealed a narrow dirt trail. Where did it go? A few footprints were pressed into the damp mud ahead of me, so I wasn’t the first to follow my curiosity. I wondered who else had been here before me; maybe the trail was already familiar to them, or maybe they had set off exploring the unknown, like me. I made my way forward, ducking under limbs, pushing branches out of the way, navigating around vines with thorns. A few paces in, I stopped, surveying the scene—a thick, wild wood had engulfed me: the scent of evergreens, fresh and new; trees with the first hints of green leaves; tall brown grass. Looking around, I was reminded of being a kid, exploring the woods in front of our house. Maybe it was because there was something mysterious and enchanted about the interior of the park, like a secret garden, long overgrown and forgotten. Looking around, I was reminded of being a kid, exploring the woods in front of our house. Maybe it was because there something mysterious and enchanted about the interior of the park, like a secret garden, long overgrown and forgotten. I continued on my way, stepping, climbing, exhilarated. I wasn’t sure where I was going, exactly, and maybe that was the thrill. Up ahead, the trail forked and I considered my options. On one side, a tree had fallen over the path, most likely during the ice storm last fall. On the other, the trail seemed to fade into thick brush. I chose the fallen tree, mainly because I wanted to climb over it. And just as I crested the trunk, a knobby branch caught my pants and ripped a hole in them. I leaned down to inspect the damage—it was a jagged tear, about 3 inches wide, on my upper thigh. The fabric was tattered and irreparable. I heard voices up ahead and I could make out the outline of two women walking on the other side of a line of trees. I could see the black pavement of the walkway—I’d made it from one side of the park to the other, I just needed to navigate the last bit of brush. When I finally emerged out of the woods, it was to an open clearing in the more habitable part of the park, right in front of one of the more popular playgrounds. I tried to act casual, like it was a very normal thing to have done—duck out from behind a few branches, off an improvised trail, looking only slightly disheveled, with torn clothes. I rejoined the pavement, walking on. From behind my sunglasses, I glanced over at the people sitting where they were supposed to sit, at picnic tables or under the pavilions, or swinging their children on swings, enjoying a sunny afternoon in the park. Low tide. The ocean recedes, revealing a landscape that is usually hidden underwater—sea moss-covered rocks, their texture like velvet, brown and bright green and yellow. Later this evening, when the tide rolls back in, the water will overtake them, leaving just the ancient gray granite above the surf, stacked high, unmoved, unchanged, for centuries. This morning, the lobster boats idle in the distance, swinging out into arcs, than stopping. Whether they’re collecting their traps or setting new ones, I can’t tell. Brightly colored buoys are scattered everywhere in this cove, like sprinkles. This morning, the lobster boats idle in the distance, swinging out into arcs, than stopping. Whether they’re collecting their traps or setting new ones, I can’t tell. Brightly colored buoys are scattered everywhere in this cove, like sprinkles. Every color and combination you can imagine—green with white, yellow and red, blue, neon green. Some are so close to the shoreline now, in low tide, I wonder if I could walk out onto the rocks to inspect how far the ropes extend down deep into the surprisingly clear water. “Maine has the highest number of elderly people per capita,” the retired judge from Houston told us yesterday. After they offered, we joined them at their picnic table in the shade. We were surprised to hear they were from Austin, and we talked more commonalities—sports, the first Longhorns game of the season this weekend, hating Interstate 35. We sipped on our sampler flight of four beers outside the Monhegan Brewery, deciding which one was our favorite. I preferred the pale-colored Kölsch and Jacob’s was the black IPA. I’d also ordered a small glass of their house ginger beer, which was my favorite out of them all. The taste of it was spicy and cool and refreshing, perfect after the rocking hour-long boat ride and the long hike we’d taken along the island’s east coast. We woke up early that morning to catch the 9 a.m. ferry. The ferry runs twice a day out of New Harbor, once in the morning and again in the afternoon, making it a perfect day trip—five hours to explore the island, which is just enough to walk from one end to the other. When we left, a heavy blanket of fog covered the harbor and I assured myself surely it would burn off when the sun got hot in the afternoon. We got to the ferry early enough to choose a seat on the top deck with a view. A handful of other people were already there, like a couple that sat in the very back with their wire fox terrier. All of the wooden-bench seats eventually filled up—elderly couples with broad-rimmed hats and compression stockings, a group of four rowdy tourists about our parents’ age, and two couples that looked to be our age, or younger. I snapped a few pictures over the guard rail, looking out into the harbor. The fog erased the horizon line, so the scene was otherworldly—bright white and yellow light, the water a mirror; a few lobster boats anchored into the water. The fog erased the horizon line, so the scene was otherworldly—bright white and yellow light, the water a mirror; a few lobster boats anchored into the water. The hour-long trip to Monhegan was shrouded in fog; it never let up. Visibility was limited to a few feet beyond the boat’s sides, so you could make out the rippled surface of the water, and our wake. I kept my eyes closed to avoid getting sick, just letting myself feel the motion of the boat moving across the water, back and forth, sometimes forward and backward. When I did open my eyes, it really was a beautiful, mysterious scene: the bright light diffusing through a fine mist of tiny water particles, dispersed through the air. We landed on Monhegan Island in a little over an hour’s time. I was sad to miss the view of the island as we arrived, since the fog obscured everything. Once we got off the boat, visibility increased, and you could make out the inns and shops and houses—and the immediate feeling of history: upright wooden-shingled colonial houses, brightly-colored front doors, stained brick chimneys. I brought one of my Maine guide books and circled the places on the Monhegan Island map it mentioned: follow the Burnt Head trail, then turn north on the Cliff Trail to Squeaker Cove, then head back west through the Cathedral Woods, back to the village. A short walk (and a few wrong turns) lead us to the first sign, so we set off. What we found was awe-striking: a hike through a dense forest that eventually led up and over rocks to five separate panoramic views of the cliffs and the ocean. “It’s like something out of a movie,” Jacob said. “I just can’t believe we’re on an island.” We took a few minutes to sit down on the rocks overlooking one of the cliffs. A man in a brightly-colored orange shirt sat on the rocks in the distance, the only foreign color in the scene. The sound of the surf roared down below, crashing on the rocks. I remembered something the guide book had mentioned: this is were you keep a healthy respect for the ocean. The fog hadn’t completely cleared, so you didn’t get a complete view of the ocean’s horizon line, but it was enough to see the jagged outline of the cliffs and the pine trees clustered at the top. The sound of the surf roared down below, crashing on the rocks. I remembered something the guide book had mentioned: this is were you keep a healthy respect for the ocean. We hiked on, doing our best to follow the illustrated map—climbing sometimes vertically over rocks, then down steep ledges to continue on the trail. We passed a few other hikers—groups of elderly people with hats and belted shorts and walking sticks. “If they can make it, we can,” Jacob joked. I laughed, out of breath. The last part of the trail heads through the Cathedral Woods, a thick, shady forest that runs through the interior of the island. I wondered how a complicated landscape ended up on an island, which seems like an abbreviated version of the mainland—but Monhegan boasted all the complexities of a rich geography, and the forest seemed to mark it’s own legitimacy, in case you had any doubts. It was cool in the forest, and I could understand its namesake—the cathedral of tall trees overhead; a sacred place all in its own. After two hours of hiking, we were hungry. I’d packed the same picnic lunch as I have every day this week—sandwiches, crackers, hummus, cookies, the added treat of a brown-spotted banana. We hiked up the hill to the lighthouse and found a bench overlooking the island. From the spot, you could see Manana Island off in the distance, a cemetery with white headstones, the cluster of rooftops in the village center. I stopped to snap a few pictures of the man painting a small canvas on his portable easel. He stood with his back to the path, working paint with a tiny detail brush. I imagined what it would be like up here, painting, an audience of passing tourists that stop and watch you work, appreciating your efforts to capture the scene. We left Monhegan content, tired, a little sunburned, and full of beer. Jacob ate an ice cream cone on the walk down to the ferry and I took a few licks; it was melting quickly in the afternoon sunlight. The fog did eventually burn off, enough for us to get the view of the island as we left and headed back out to sea. On the ride back, we spotted seals and porpoises and everyone cheered and clapped as sightings were announced. I didn’t close my eyes this time: I wanted to remember it all, take it all in, this day spent on the island out-to-sea. I set off on the trails, alone. I wanted to make each loop, take them all in, mark my progress on the map. It took a little under an hour, just enough to be full and satisfied with my portion. I went early enough to escape the summer heat, to pause overlooking the creek in a fleeting cool breeze. How lovely it is to be under the shade of tree branches, with nothing but the sound of gravel underfoot, moving forward. My secret landmarks still stand, quietly—the giant tree with the enormous, ancient trunk; the long bench with the mysterious L.M.B quote; the lonely gazebo out in the tall grass; the angled red rocks near the creek’s shoreline. Maybe one day I’ll match them up in my mind with their corresponding trail letter and color, make them serve as a true indicator of my location. I took time to explore, to get off the path. I wandered down near the pond in damp mud, then climbed down on both sides of the creek to walk the red-rocked banks. On one end, you can see the metal bridge in the distance, on the other, the stream winds away from the boundaries of its stony beach. Instead I found the place full and brimming with summer—all green leaves and wildflowers in golden sunlight. It’s the most beautiful place in this city and I’m content to think it’s still a wild, hidden treasure. On the climb up from the creek, tufts of dogwood cotton had collected along the outer edges of the trail, as if they’d been swept from side to side to clear the path. They’re the last remnants of spring, a season I missed entirely at Martin Nature Park. Instead I found the place full and brimming with summer—all green leaves and wildflowers in golden sunlight. It’s the most beautiful place in this city and I’m content to think it’s still a wild, hidden treasure. It’s vast enough to feel like you could get lost, but small enough to know all the well-marked trails will lead you back home. 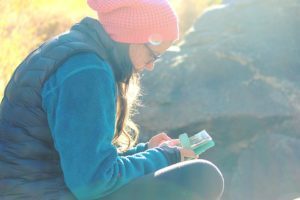 I passed a few people along the trail, all with a nod and “Good morning.” Most were alone, like me, and I wondered as we exchanged glances—do you need this place like I do? Do you need the tall trees with branches curved into a canopy of shade above, the open meadows that rustle with tall grass, the creek that ripples and murmurs over eroded stone? Yes, I think. I know we both do. And we continue off in our own separate directions, down our own trails. I had just finished a workout at the gym and was settling into my favorite part of necessary, obligatory exercise: stretching. I was standing near a wall, grabbing the ankle of my foot, when I noticed something: a pink plastic Easter egg, hidden down in the center of the leg of one of those aerobic step risers. I noticed a few more eggs scattered around. There was an orange one in the corner behind a rack of hand weights, and a blue one poking out from behind a stack of yoga mats. Why were they there? I could only imagine they were the spoils of a recent Easter egg hunt for the after-school kids. I looked around, wondering if anyone else had seen them, too. I’ll admit it—my first thought? Candy. But as an upstanding, cardio-committed adult, I decided to abstain from picking one up, shaking it, and keeping it safely in my palm until I was driving away from the parking lot. But I couldn’t help feeling like I’d found something—that little pink egg, even if I had left it behind. It was in an excellent hiding spot, and I’d been the one to find that last little lost Easter egg. On the drive home, I got nostalgic about Easter. I still have the wooden Easter basket my grandpa made for me when I was a kid. Both ends of the basket are shaped like a bunny’s face, and it’s painted white, with lines for whiskers around the nose. My name is painted onto it, too, the handiwork of my mom. The letters are playful and arced, with decorative dots on all the ends. Growing up, we’d wake up on Easter Sunday before church to look for our Easter baskets. They had been carefully hidden around the house, and we’d tiptoe around while my mom gave us “hot” or “cold” clues. Nothing was better than knowing you were getting closer, like following a treasure map. Once we’d discovered our baskets, we could dig into the bounty of treats they held—SweeTarts, Nerds, Peeps, Chocolate Bunnies. Sometimes, I could make my trove last all week, but usually I’d dig in and delightfully overdose on sugar. The wrappers would be scattered around me on the floor, the only evidence of everything I’d consumed. Maybe there will always be something remarkable about a hunt—and the reward. Once we’re adults, the hunt turns to more intangible things, and the clues get harder to discern (and that’s assuming we’re given any). And the reward? That’s where it’s so easy to lose sight. We’re harder to satisfy. We don’t take the time to savor what we find. What’s so special about these memories? Are our childhoods only magnified once our roles are reversed, once we’re the one stuffing candy into plastic eggs, hiding wooden baskets under blankets? Discovering that lost Easter egg today felt like a benevolent reminder–don’t stop hunting for meaning in the everyday. The search is on—for little bits of beauty and meaning. The rewards truly are all around us, but they’re hidden until we tune our eyes to the shape and color and texture or sound of it, or until we break open what we find to examine it, and taste the sweetness. I have a confession: I hate Facebook. And I’m not wading into exaggerations here (which I’ll admit I’m prone to do)—I hate it. Facebook, for me, evokes the same feeling of other things I really despise—like sitting in traffic, using the stair climber machine at the gym, going to Walmart, or owing taxes. So how exactly did I get here? It wasn’t always this way. Once, a long, long time ago, Facebook was different. At the time I joined, Facebook required you to have a college email address. So, at the time, Facebook was really just an online version of a very limited social circle—your college friends and classmates. I know that potentially sounds very superior and exclusive, but it made the purpose of having a profile on the site a little more simple. You posted what you were doing over the weekend or how awful your latest art history exam went. You made plans for study dates and wrote on someone else’s wall with inside jokes. Most of all, you knew everyone you ever knew didn’t have access to it—to this particular online representation of yourself. William James once wrote, “A man has as many social selves as there are individuals who recognize him.” But what happens when you’re forced to choose just one “social self” to display? When the audience grows to include your family, your coworkers, your elementary school classmates, your childhood Sunday School teacher? This makes the question of what you share and how you portray yourself a bit more difficult. One thing seems to be certain: it’s easy to make sure this online version of yourself is the very best version of yourself—always saying the right thing, always smiling, always doing something fabulous or exciting. But is that “self” even really a real person? I think Facebook is a great, wide ocean of potential discontent and jealousy and envy, even if we try our best to be good, smiling Christian souls. When all we see of other people’s lives are the happiest, perfect moments, our vision gets blurred. If everyone else’s lives are so great, shouldn’t ours be, too? Or shouldn’t we be trying our hardest to make sure our lives look just as shiny and happy and fulfilled and worry-free? During my lifetime I’ve seen a shift, but I want to be careful about the blind nostalgia of “the good old days.” Keeping up with the Joneses is a phrase that’s been around for more than one hundred years1, so I’m not naive to think we aren’t all given to comparing ourselves to others, even on some subconscious or irrational level. We can’t help but compare what we have to what other people have, but maybe there was a time when what we potentially had to envy was a bit more limited. Maybe social comparison (and social discontent) was more limited in scope—back before Facebook. I think Facebook is a great, wide ocean of potential discontent and jealousy and envy, even if we try our best to be good, smiling Christian souls. When all we see of other’s lives are the happiest, perfect moments, our vision gets blurred. If everyone else’s lives are so great, shouldn’t ours be, too? Or shouldn’t we be trying our hardest to make sure our lives look just as shiny and happy and fulfilled and worry-free? So what’s the solution to all my Facebook woes? Do I jump ship, as many brave souls have done before me? Believe me, I’ve considered it. 1. Set limits with my time. I can’t mindlessly scroll through timelines, refresh for new notifications, go through other people’s 1000-photo albums (alas, feeling like a “creeper”). Are there better ways I could be spending my time? Heck yes. Every minute I spend on Facebook is one minute lost doing something more productive or refreshing, so I need to be conscious of this. 2. Be mindful of how Facebook makes me feel (which is usually lousy). Have I ever really gotten onto Facebook, wanting to yell with delight, “THIS IS SO GREAT! THIS IS BETTER THAN VACATION!” No. But I’ve learned it’s important to know and recognize emotions—especially negative ones. Am I raging mad at someone’s political rant in my newsfeed? Absolutely. Am I feeling helpless to change their whole worldview with one well-worded comment? Yep. Do I feel really behind in things like foreign-country visits or entering motherhood? Yes, and yes. 3. Evaluate my motivations for what I share. This is a big one for me. Am I bragging? Am I showing off? Is it authentic? Does it represent good boundaries between what’s public and private? 4. Be conscious of how I grade myself on feedback and comments. Do I want to feel noticed, recognized, and approved? Do likes and comments really mean those things? Really? 5. Be ok that I might be missing out on knowing some important life events. Sure, I’m fine with giving up the knowledge of what some acquaintance from grade school ate for dinner last night, but I also have to be ok that I’m missing out on photos of my sweet nieces, or of my cousins (all growing up so quickly!) by my limited Facebook involvement. If I set limits on the time I spend on Facebook, I’m bound to miss out on something. 6. Be more intentional about fostering relationships and having personal interactions with those that I love. Facebook isn’t a substitute for a phone call or meeting up for coffee. It isn’t an excuse to not make time for spending time with friends and family. I shouldn’t pretend to know what’s going on in your life based on your recent Facebook posts. 7. Value privacy. See it as a rare, special gift. Are some moments (and the pictures of those moments) not for anyone else to see or know about? Does knowing that a moment—a dinner out with friends, a concert, a vacation—is something only you will live and experience make it a more valuable memory? I’m starting to think so. So to everyone out there scrolling Facebook timelines, thinking needles in their eyeballs would be a better alternative, I feel your pain. What will we think of Facebook in ten, twenty years? I don’t know. But for now, I want to see Facebook for what it really is—a digital, highly-curated version of our imperfect lives. It will never beat living the real thing, everyday. It will never beat truly knowing and loving those that are dearest to us. It will never beat seeking to view the entirety of life, holding the good days and bad days close. We meet up at a little tea house not far from my house, get teapots of our favorite tea, and talk. We talk about what we’ve been working on lately and how things are going. We talk about issues we’re having in our creative pursuits and, usually, between the three of us, come up with creative solutions to our latest conundrums. Sometimes, it’s all high-fives and great-jobs (yes, we have show-and-tell time). Ladies just need to talk. I know that now—as much as I need to write things out, I also need to talk them out. So our little meetings have been a chance for me to wade in about writing and the challenge of balancing creative work with the rest of life, and how to stay inspired. They were the first to know that I’d decided to write a book a year ago, and sometimes I wonder if I could have actually gotten it finished without our meetings (and their friendship). They’ve kept me sane, focused, accountable—through verbal processing and the cutest little teapots of sweet almond tea. Last night, we met up again. It was a damp, dreary night—a perfect night for hot tea and staying indoors. I brought a book along to share: Creative You: Using Your Personality Type to Thrive. I’d emailed Emily and Rachel earlier in the week to ask them to take a personality test. Since taking the test myself last week and getting my results, I’ve been enamored with everything I could find to read about my personality type. Why? Well, it’s spooky. I’ve learned things about myself—those rare, objective things that are completely outside of your own arrived-at revelations. It was a glorious dose of insight. And I hoped I could share it, that I wouldn’t be the only one feeling like I’d just gotten a healthy heap of affirmation. My personality type (INFP) is prone to pursuits of self-exploration and self-discovery and introspection; it’s good to know that. I also need time to think and derive meaning. I’m an idealist; possibilities interest me more than realities. I struggle with perfectionism and sharing my work publicly—again, true to my INFP nature. Are four letters enough to represent all the complexities of our inner lives, our preferences, our habits, our hopes and fears? Thoreau once said, “Know your own bone; gnaw at it, bury it, unearth it, and gnaw it still.” Are four letters enough to represent all the complexities of our inner lives, our preferences, our habits, our hopes and fears? Probably not, but maybe they’re a start. On days like this, I could bottle up all the words I’ve spoken, because they are so few. Only because I went out into public, there are a few handfuls of thanks-yous. Add a hello. A simple question (which tea do you recommend?). A yes. And yet another thank you. On days like this, I mostly try to listen. The advantage of being in a room full of strangers is knowing they don’t know you, and most likely, they aren’t taking any notes. So you can glance up, or glance over, listening. The more their conversations roll on, the more you know—and usually (hopefully), you’re glad you were eavesdropping. You found some nugget of gold you can spin into words and sentences later. Or maybe even into poems. Poems, today, happened. They fell out of the sky and I caught a few. Am I a poet? I was for about an hour today, sitting in the tea shop. I listened. And I wrote. I took sips of my tea. I sat at the back of the room, so I could watch. I needed to make sure nothing would get lost. So I took it all in: the ladies sitting in the corner, whispering. The old man wearing a scarf, waiting. The girl in blue with a face from a painting. The woman hunched over the counter, the round shape of her back. The two teenage girls discussing their antidepressants, how the drugs effect their brains. Another girl spelled out her name, explaining the origin: she’d been named after a woman her mom met at church. “That’s beautiful,” was the reply from the girl behind the register. I left and drove downtown to the art museum. I took the long route, the slow route, intentionally. I resisted pulling out my phone to load the map. I just wanted to navigate and find it on my own. Would I get lost? Would I have to circle back? Maybe. I found myself parked directly under a tornado siren at noon on a Saturday in Oklahoma City. I stared up at it in wonder, hardly believing the volume of the noise it made. The sound vibrated my purse against my hip and made a deep, dull ache in my ears and chest. I walked away, as fast as I could, to take shelter from the noise. The featured exhibition at the museum had the title Intent to Deceive. The room was bustling with people—standing, reading, looking. I decided to be methodical about taking it all in. Usually I wander quickly through the rooms—like taking a huge glutenous gulp of water, rather than small, prudent, savor-it-all sips. All of the paintings on the walls were fakes. Frauds. Deceptions. A black and white photo of each artist/conman was printed on huge panels with their stories and the timelines of their demises. Some had gone to prison. Half had committed suicide once they were discovered. All of their stories somehow noted the fact that they couldn’t make it on their own as an artist, so they had resorted to another career—posing as wealthy heirs or art dealers with considerable collections of previously unknown works of art. Some were completely disenchanted with the art world, so they’d retaliated, composing their own moral standards of only selling pieces to expert art collectors, and not people who wouldn’t know any better. One had even fallen into the crime by accident, when a drawing he’d done was mistaken for a Picasso. He was poor and the money he was offered for it was just enough to buy him food for the next few months. So that is how it began. As I stood looking at some of the paintings, I got lost in the idea of their histories (thinking: could this be a idea for a novel? How easily someone could fall into this?) The unrecognized genius craving recognition or renown—at any cost? I was struck silent by their talent. Their technique. Their craftsmanship. One of the men had successfully sold fake Vermeer knockoffs. When I peered into the painting, I marveled at the skill involved—not as single visible brushstroke in the oily, sheer texture of seemingly-antique oils. It was easy to see why you could be fooled. You could be so enthralled by the beauty of the thing, you’d want to believe the authenticity. These men were inventive, too, in creating recipes for paint and finding antique canvases and paper. They’d learned to stain, crack, dilute. Had they actually had access to any of the originals? Or did they have to paint from memory after standing, like me, in museums, staring? The stories they told to authenticate the artworks were believable. Some had partners that moved the business along. They’d made fortunes. But they’d all been found out, in the end. The last room of the exhibit was interactive. The true identity of paintings were behind sliding panels. You had to guess if they were real or fake, then slide the door over to reveal the answer. Two small paintings were hung vertically, their subject matter exactly the same. I tried to make my guess, formulating my reasons for deciding which one was real. The top one was more washed out and it looked older, so it had to be the real one. Only after I knew I was wrong did the comparison reveal new clues: it was all in the light. The top one had oversimplified it, glossing over the intricate depiction of the sunlight falling through the branches and onto the figure’s back. In the real one, the light was something only a true artist would have been so honest about, so committed to the hard work of telling the truth. BATHERS by Lionel Walden (1861-1933), 1895, oil on canvas.